I love nachos. And given that I’m Japanese, it’s no surprise that I also love sushi. But to find out that the winning recipe at this year’s Inland Northwest Healthy Nacho Recipe Contest was Ceviche Nachos, induced a bit of skeptisism. Granted, we’ve tried nacho cheese on gourment sausages, we’ve even tried nacho cheese on ice cream, but raw fish? No, really. 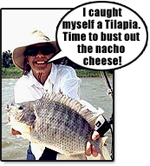 Fish…that’s raw…with nacho cheese. That’s the winning recipe? Ann Yanecek’s Ceviche Nachos won the top spot and will be featured on the Downriver Grill menu through Cinco de Mayo. Yanececk said her inspiration came from a fish taco recipe that husband loves. If anyone lives in the Spokane, Washington area and cares to order up a plate, please take a picture and send us a review. We’d love to post it up on our site! We’ve all been in a fight. “Hey, that’s my girl!” “I am NOT a wimp!” “I said I wanted my Appletini shaken!” But I don’t think a fight has ever broken out because of nachos. Until now. 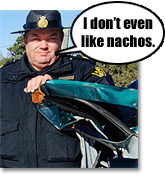 Two 16-year-old girls were arrested for assault and battery on Friday, April 13 (how appropriate) at Revere High School after an argument over nachos turned ugly… The argument, that is… Not the girls. We don’t have any knowledge that the girls are anything below average looking. Captain Dennis Collyer of the Revere Police Department said, “The girls were in the school’s cafeteria in a lunch line around 11:30 a.m., when they began to punch each other.” The Captain had no further details about the nacho fight. Nacho loving Dodger fans have reason to celebrate. Dodger Stadium has converted their right-field pavilion into “All-You-Can-Eat” seats. For $35 in advance or $40 on game day, fans will have access to as many hot dogs, peanuts, popcorn, soft drinks, and best of all NACHOS as they want. But before you go out any buy a ticket to the next game hoping to stockpile some cheesy goodness into your napsack, be aware that there are limitations. The food booths open 90 minutes before games and close two hours after it begins. And if you try ordering 100 bowls of nachos you’ll be denied. But, “if a person goes up there and asks for four for his family, he won’t be told no,” said Camille Johnston, the Dodgers senior vice president of communications. Hats off to the entire Dodger organization for providing such a great fan amenity. We salute you! Oh look! A birdy just landed on my windowsill. Aaaaand, there it goes. Oh yeah. MasterCard and Taco Bell have made the process of getting our nachos even faster! They’re currently testing the MasterCard PayPass Touch & Go payment solution at approximately 100 Taco Bell stores. This means that the next time you want to order enough nachos to get your daily allowance of Vitamin C, you’ll be able to shave precious seconds off your total wait time. Priceless! 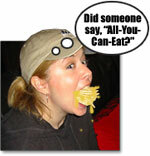 Author Joe Brian and StevePosted on April 10, 2007 Categories News2 Comments on Nachos. Faster. Nachos = Win for Florida? Story suggestion by: Dan R. Email us a story. At halftime, the guys grilled hot dogs and drizzled hot nacho cheese sauce on them directly from the fountain. Author Joe Brian and StevePosted on April 9, 2007 Categories News2 Comments on Nachos = Win for Florida? Yesterday, ABC owned KGO-AM 810 Radio invited us to their Downtown San Jose, California office to participate in a quick interview with reporter Rob Artigo. Excited, the three of us hopped into a car and drove over wondering what to expect. When we arrived, Rob greeted us, brought us into his studio, and flipped open the mic. We chatted, laughed, and had a great time for about 20 minutes. A few hours later, our segment was broadcast over the San Francisco Bay Area airwaves for all to listen to. We couldn’t be any happier with the way it turned out! We were able to obtain a copy of the clip for your listening pleasure. SANTA CLARA, CA — MARCH 4, 2007 — The worldwide leader in nacho cheese related news and entertainment, I Love Nacho Cheese, today announced that their website, www.ILoveNachoCheese.com, is the subject of a feature story in today’s issue of The San Jose Mercury Newspaper. The article, written by staff columnist Linda Goldston, appears on page B1 of the Local Section and includes an interview with the site’s three co-founders. To continue reading the entire press release, click here. To read the San Jose Mercury Newspaper article, click here. Nachos Now With 100% More Botulism! We’d like to think we would try any nacho out there at least once for the sake of review. 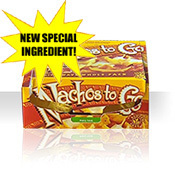 But after careful discussion, we decided against Mexican Express’ Nachos to Go product. Call us crazy, but we’re not really “down” with botulism. Simply put: Contaminated nachos just aren’t cool. Could’ve fooled me. No offense, but one look at Woolley would lead one to believe otherwise. Regardless of whether or not the good Sergeant (if he really IS a sergeant) is being truthful about his snacking habits, one must wonder: If he doesn’t hold that record, who does?